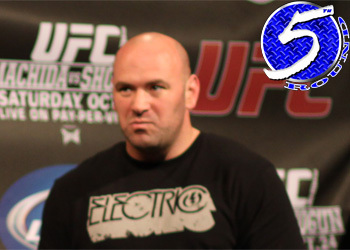 UFC president Dana White has just become the most popular kid in school. Late Sunday night, the promoter accidentally posted his direct office number on his Twitter account. Not too big of a mishap for most of us loners, however White has over 1 million followers that quickly took to the phone lines. White was attempting to arrange a tour of “The Ultimate Fighter” facility and UFC gym in Las Vegas, Nevada for a fortunate fan and her boyfriend – who will be headed to Sin City to celebrate her birthday. Despite his extensive experience with the social networking agent, White mistakenly posted his digits to the entire world instead of sending the aficionado a direct message that only she could have seen. ” 😀 my pleasure. Call my office 2 morrow 702 *** ****,” White Tweeted. As expected, the telethon kicked off just moments after and the man that transformed MMA found himself fielding calls from followers all over the globe. With a busy few weeks staring him dead in the eyes, White quickly allowed his voice mail to resume its post. “I [expletive] up and tweeted my number lol but I got to talk to a lot of cool people. Thank u all!! !” White wrote.